Memes usually consist of a picture that signifies something. There’s the Actual Advice Mallard who gives pieces of legitimate advice. There’s also Confession Bear who states deep dark secrets that range from a love of nose picking to actual murder. Chances are that if there is a very particular story or emotion that you need to evoke, there is a meme to match it. One meme that usually garners nods of approval is Captain Hindsight, who originated in South Park. This spandex-clad Captain points one finger to the sky and states platitudes of things that really, people should have seen coming. The image had thousands of views and many accolades as to its accuracy. For the first time, I cursed all of those morons out there on the Internet. These were supposed to be my people. How could they be so naïve? On the one hand, I understand where the Captain’s coming from. People should always go into a marriage with open eyes and clear expectations. But how could they assume that a difficult career trajectory was the only aspect in determining whom you marry? It made me think about a lot of things, including why I married a military man. I never wanted to marry someone in the Navy. Why would I subject my life to constant interruptions from moving, a poor chance at a steady career, and a spouse who would be intermittently absent? Really, it didn’t sound like a good deal. But before I met my husband, I didn’t have a good idea of what being married would mean. I didn’t know what to look for. I’d had my heart broken more than once and I couldn’t fathom what it would take to commit to a life with someone. Now I know. My spouse is someone who I never tire of. I feel more myself when he is next to me than I do sitting alone. He is the one person who can make me angrier than I knew possible, and also the only one I want to comfort me when I am down. He knows all of me and accepts it. And I know and love him back. When you find someone who does that, how can you not try to form a life together? It is literally the foundation for why people should get married. And with any partnership, there is a give and take. I gave up my home. I gave up a good job with a free graduate education. I gave up seeing my family as often as I wanted, and I gave up the consistency of living in the same area for an extended period. In exchange I got the ability to take some time away from an office to explore my true passions. I got a man who enjoys cooking and allows me to eat like an adult instead of foraging like a feral child. I got a dog and started to form a new family. I got to experience living in new places and meeting new people. I will get to live in Hawaii soon. My husband made concessions as well. He gave up on the hope of retiring to a state without income tax, because he thought it only fair I could decide where we live after the Navy. He gave up playing video games until dawn. He gave up assuming that all free time was “his” time, and now knows it’s “our” time. For his part, he got someone task-focused in his life that happily took over budgeting until all debt was paid off. He got the ability to never worry if the stockpile of toilet paper is low. He got a new drive and passion in his career, because it’s not just him anymore. We both got a lot in the end. We got each other. We both get to know we’re married to someone who knows and loves us- flaws and all. We both get to wake up to each other. We both get to look forward to what our future looks like together. We get to know that no matter what, we’re in it together. In Plato’s Symposium, Aristophones tells a crowd of drunken philosophers that in the beginning, there were circle people. These beings had two heads, four arms, four legs and one body. In that form, the circle people were so powerful they tried to take on Olympus. Zeus decided to chop them in half to reduce their power, creating singular beings. These single people do not feel whole, so they are always questing after their other halves. Once two separated beings find each other, they never want to be apart again. And that is the origin of love. I found my other half. 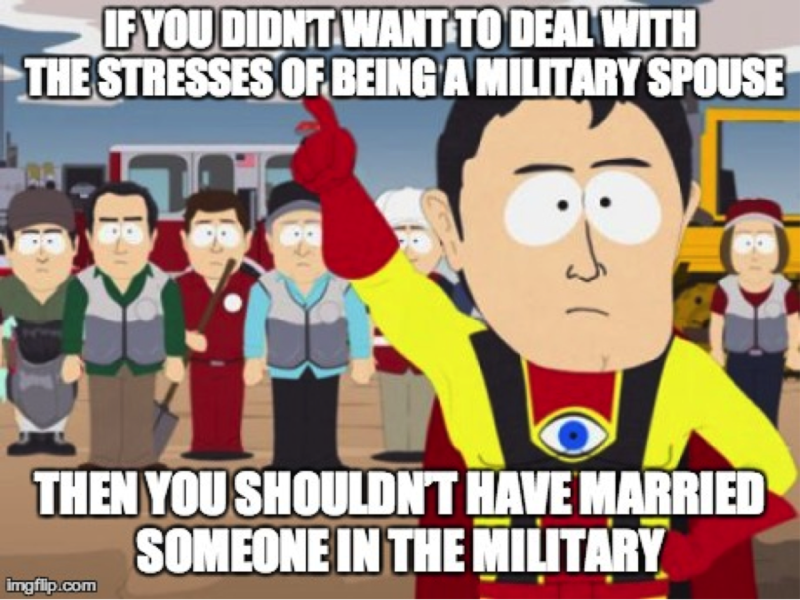 And no, I honestly do not want to deal with the stresses of being a military spouse. There are many benefits, to be certain, but I hate that I have to be separated by deployments from the person I love, I hate moving frequently, and I hate that I don’t always get to pick where I live. I imagine that most partnerships involve sacrifices and stresses that are balanced against the benefits. So while there are downsides to this lifestyle that I’d prefer not to have, I wouldn’t change it, because the scales are heavily stacked in favor of being whole. Categories: Uncategorized | Tags: Captain Hindsight, love, marriage, memes, military spouse | Permalink.